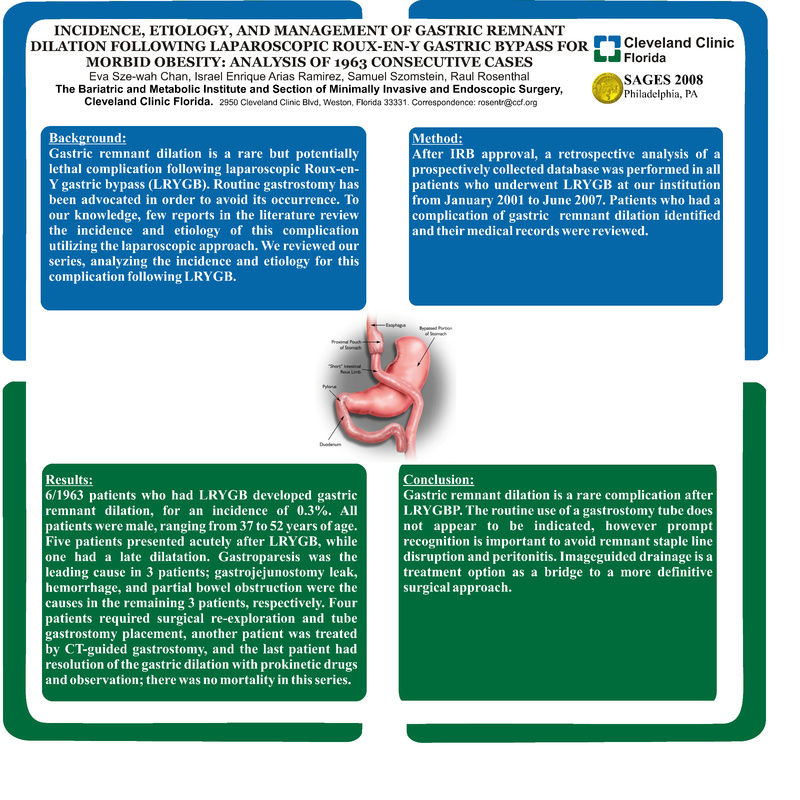 Background: Gastric remnant dilation is a rare but potentially lethal complication following laparoscopic Roux-en-Y gastric bypass (LRYGB). Routine gastrostomy has been advocated in order to avoid its occurrence. To our knowledge, few reports in the literature review the incidence and etiology of this complication utilizing the laparoscopic approach. We reviewed our series, analyzing the incidence and etiology for this complication following LRYGB. Method: After IRB approval, a retrospective analysis of a prospectively collected database was performed in all patients who underwent LRYGB at our institution from January 2001 to June 2007. Patients who had a complication of gastric remnant dilation identified and their medical records were reviewed. Results: 6/1963 patients who had LRYGB developed gastric remnant dilation, for an incidence of 0.3%. All patients were male, ranging from 37 to 52 years of age. Five patients presented acutely after LRYGB, while one had a late dilatation. Gastroparesis was the leading cause in 3 patients; gastrojejunostomy leak, hemorrhage, and partial bowel obstruction were the causes in the remaining 3 patients, respectively. Four patients required surgical re-exploration and tube gastrostomy placement, another patient was treated by CT-guided gastrostomy, and the last patient had resolution of the gastric dilation with prokinetic drugs and observation; there was no mortality in this series. Conclusion: Gastric remnant dilation is a rare complication after LRYGBP. The routine use of a gastrostomy tube does not appear to be indicated, however prompt recognition is important to avoid remnant staple line disruption and peritonitis. Image-guided drainage is a treatment option as a bridge to a more definitive surgical approach.